On June 24th, 2016 Blue Canoe Records will release “Decade II 2006-2015” from baseman and producer, Joseph Patrick Moore. Mr. Moore looks back over the past decade and remixes the hits for a fresh new perspective. His work fuses elements of contemporary jazz, for which Mr. Moore is famous, with funk, rock, pop, urban, spiritual and even electronica for a compilation that keeps listeners on their toes. Joseph Patrick Moore is a prolific jazz, pop and rock musician as well as producer, session musician, film composer and author. He has worked with artists such as Stewart Copeland (The Police), Earl Klugh, Bob James, Chris Duarte, Celtic Women Lisa Kelly and Chloe Agnew to name a few. “Decade II” is fresh on the heels of “XYZ Factor” and “To Africa With Love” where Mr. Moore coupled its release with a mission trip to Africa. There he was involved personally on the front line of support for the amazing and lost continent. JPM gives a taste of all…work from soundtracks (Path To Geshe), solo work (XYZ Factor and To Africa With Love), group projects (The RockTronix) and projects with friends (Christmas Time Is Here with Dan Baraszu and work with Soulful genius Chinua Hawk). “Decade II” opens with the expansive “Ubuntu” originally on “To Africa With Love” (2010). Mr Moore leads with a looped bass formation and drives a powerful line over the top. Joined by supportive guitar and keyboards, the melody tells a beautiful story of hope Moore saw during his time spend in Africa. The anthem finally gives way to a subtle electronic feel in the melody as it fades to the next track. “Quest” is a song that JPM wrote for Yonrico Scott’s solo album, “Quest Of The Big Drum”, featuring Scott (Grammy winning drummer with The Derek Trucks Band and Royal Southern Brotherhood) and Nick Rosen. The listener enters the song on a light bed of keyboards with chaotic bass playing over the top. The chaos gradually finds peace with a deep, impassioned funk rock groove with a tantalizing melody from Rosen’s keyboard. Quest indeed! “Magnificent Obsession” is a rock number from Mr. Moore’s band The RockTronix that is saturated with mischievous interplay between Chris Blackwell’s guitar and Mr. Moore’s sparse fretless bass line. The testimony builds throughout, graduating from funky, colorful guitar textures to full on rock guitar and back again. “Magnificent Obsession” shows again not only the versatility of Mr. Moore but also the capability of his accomplices. “Decade II 2006-2015” is a comprehensive look at the last ten years from a true music talent of our day. 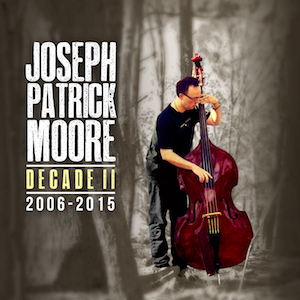 Joseph Patrick Moore manages to fuse current and classic and he makes it look easy. Truly, the listener is left impatient…what will the next “Decade” bring?